Magician asks a spectator to draw a card freelyno force, and sign it. Then put the card back into the deck, and shuffles the cards. The magician shows one card on the top of the deck, but it is not the same card the spectator signed. Put the card into a clear plastic sleeve ,the spectators can see the face of the card is still not the signed card. The magician holds the sleeve, then the card slowly and visibly changes into the signed one!! 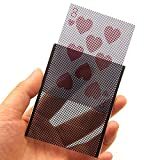 The card can be removed the sleeve by spectator and there is nothing else in the sleeve!! The Amazing World of Magic. Learn all the tricks of professional magicians. Joel Bauer professional speaker, hypnotist and magician will teach you 12 unbelievable Mind reading magic tricks and effects that will shock your friends, business associates and audience. You will see Joel in an on screen video on your computer screen. The show featured on this CD is suitable for audiences of all ages and is adaptable to a variety of occasions. There is a fun-filled mix of innovative amazing mental telepathy and magic stunts. Enjoy the show and then prepare to learn the secrets of a master as every nuance is revealed. People will think that you can read their minds. Imagine how amazed your friend will be when he chooses a word from a book and you are able to point out exactly what word he has chosen. The amazing variety of presentations featured here will captivate any audience and impress them with your incredible mental abilities. 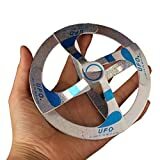 ❉Magic UFO, no battery, no remote control, you can dance around anytime. ❉Suspension of UFO is the most novelty toy. You can play it all kinds of tricks! You can play alone or share with others. Prove your skills to save the magical pets! All the magical pets have been stolen! You have to follow the trail and find the predator that committed this audacious crime. Solve all of the puzzles and rescue the magical pets from the tenacious claws of the crafty thief. Open their cages and free the pets! Original deals, fantastic creatures, a magical atmosphere – and all of this is just the beginning of an exciting journey! Discover secrets of the masters. 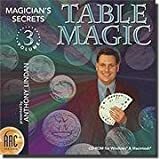 In this third volume, Table Magic, professional magician Anthony Lindan returns to reveal the techniques of specially selected table-top magic tricks, presented with video, audio, and text. You’ll be performing amazing effects in almost no time at all! Then delve deeper, learn the intricacies of deception and presentation, and you will soon be adapting the broad principles of magic to create your own unique performance.